Anne has received a series of 12 new locutions. We intend to send them as they come. Please share these messages. We feel they are very important. Know that the Church in Heaven is intact. Know that saints gone before you desire your success. Do you want to be successful in playing your part for me? Then you must desist from any effort to draw away from unity in the Church. The results for you will be serious if you engage in conversations or activities that weaken unity. I arrange for you to hear this so that you can be warned. If someone is attempting to deconstruct what Peter established, then that person is not my champion. You must look elsewhere for companionship. My hope for renewal lies partially in your commitment to me. Will you serve me? I am asking you personally and in my request is also an instruction. Remain faithful to my Church. Hold your position of fidelity. 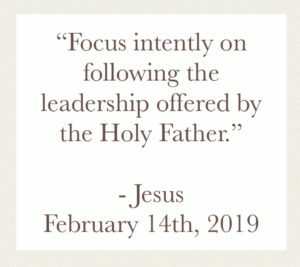 Focus intently on following the leadership offered by the Holy Father. “There are many men and women who serve me. I thank each one of them. My gratitude is made known in their detachment from worldly goals. There can be a balance between the two, heavenly goals and earthly goals, but with my true servants, the side of Heaven always carries the day. I am offering these few words to my friends because I am looking for courage. My dear friends offer me many days of their life or many moments in their days. Many have offered me gifts of great value and also gifts of small value but which are exceedingly valuable to me. All of your gifts console me and fill me with hope about the future of our faith presence in the world. My friends, when I ask for courage, I am asking for a quiet and firm disposition toward unity in our Church. There must be no divisive conversation. There must be no pretence that one accepts a side that is against unity. If one sees a side against unity in our Church, then one is seeing the side of my enemy. My enemy is personal, but also universal. He is your enemy. If you believe that you can turn a spirit to its opposite disposition then I am telling you today that you must leave that to me. I am asking you for courage and I am also asking you to stand down from conversations with those who seek to divide our Church. You may wonder why I make two seemingly conflicting requests. I will tell you. Courage is needed to advance the development of our Church. There must be total and intense focus on the developments I am seeking. Hard work is needed to move our religion of love into a dynamic force which will maintain God at its centre. My friends, I can see the risk in distraction. I can see the threat in energy directed against growth. You must listen to me with humility. You need not have answers that are beyond you or that you do not require today. It is often enough for you to have instructions and direction. With those, you may proceed, confident that with your small effort I can achieve large movements. I take your effort and combine it with the small effort of another, perhaps a person you will not know on Earth, and I obtain the outcome I desire. You must trust me. My wisdom is quietly filling those who’s humility will entertain it. My wisdom works steadily and often the events which are the most meaningful to my effort, seem almost insignificant to you. This thought is lovely for you. You will be on Earth for a short time, even in a long life, but there are those who will come after you and in a certain day in the future, they will need what you offer in the present. Do you understand what I am saying to you? My plans are far reaching. My plans construct a movement of love that acts like a magnet for the Father. People cannot resist love because they were created to be loved. Let us focus together, with the greatest courage, on fashioning a true faith that most accurately reflects the Father’s force of love. “My blessings rain down on our Church on earth. Always, I send blessings of the most sublime and powerful nature. The graces sent through the Sacraments possess the power to heal and to sanctify in a way that is absolutely unique to the person receiving the graces. Only through the Sacraments can a person receive the power of Heaven directly in this way. Can it be true that people do not want these graces? Is it possible that any person would reject what is available to them in the Sacraments? No. It is not the case that people understand what Heaven offers and refuse it. It is more accurate to say that people have become distracted from the power of the Sacraments and that they have been prompted to believe that some are more worthy of these graces than others. No one can be worthy of what God sends freely. Man is the recipient of the Father’s exceptional benevolence. Man is the recipient of the Father’s hope, not for one man but for all men created by Him. Do you understand? Each person must receive Sacramental graces and grow in confidence. The Father loves each person. 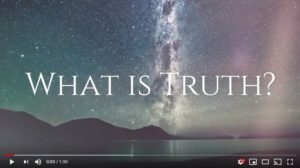 Accepting this reality is paramount to growth, for the individual and also the Universal Church. Do you receive these Sacramental graces with confidence? Are you certain of your Father’s love for you? Do you accept that the Father wishes to communicate this same love to every person you encounter? Beloved children of the one Father, if the graces in the Sacraments are leading you to serve others, then I know that you are accepting them with a disposition of humility. If you believe the graces in the Sacraments are leading you to create division, then I know that you are in error. You, too, must accept that you are in error. If you refuse to accept that My goal is unity in the Church, as well as constant development in the Church, then you must withdraw yourself from conversations about the Church, as opposed to offending me personally by furthering efforts aimed at disunity. Efforts at division are not sanctioned by Me. Read these words carefully. I am with you as you read them. I wish you joy and peace and love throughout every day of your life on earth. I want you to trust Me, Jesus Christ, to guide you. I am guiding you to humility and service and I am guiding My Church to humility and service. I am guiding you to trust that My overall goals for the Church are in sight and that if we work together, in harmony, these crucial and timely goals will be achieved. What do I need from the people of My Church? I need fidelity. Many claim they are faithful but they make war on the Church. When an enemy comes directly to one’s door, from the outside, one is prepared. When an enemy emerges from within one’s home, one is more vulnerable. My children, I do not wish you to become an enemy in My earthly home, the Church. Follow the leadership I have arranged for you, in a manner that is humble and determined, and you will see My Spirit blossoming in a way that is both fresh and compelling. Where are My beloved children? Why do they flee from our assembly? Is it I? Have I changed or demanded that they leave our Church? No. It is not I. I have watched in pain as many people have been made to believe that they are somehow less worthy than the unworthy, that they are not welcome or not received by Me. The truth is that sinners do not cause Me to fret. You are all sinners and you are all welcome. Who is driving God’s children from our Church? Ask yourself that question and do not point to the man I have chosen to lead My Church. He is in My care and I am pleased that he is following My direction. Do you wish to argue with the Holy Spirit in him? Then you must look to Me, and do so silently in prayer. Perhaps I can help you to see that the people in every assembly are unworthy. God did not create you to be perfectly worthy on earth but to be loved and to grow and grow in holiness and happiness. Would you say that every person starts at the same point? Do you believe you can judge? You are attempting to usurp My role if you believe this and you are also damaging My Church. Stop. I am asking you to stop pretending that you are Me. I am the judge. You are the ones who will be judged. I am looking deeply into your heart. If you are dissuading people from belief and total trust in My mercy, then I am asking you to stop. During Lent 2018 Anne recorded six locutions on the Passion. We believe these new messages on The Passion have been offered by the Lord to help us gain a better understanding of His sacrifice. “These messages on the Passion of Jesus are among the most profound, the most encouraging, the most loving and the most merciful that I have ever encountered” Dr. Mark Miravalle, Theologian. In addition to these locutions on the Passion, we also want you to know that Anne has received the first of another series of locutions. On Good Friday, we will send the first of these out. We get a serious feel from its tone and pray that everyone will receive this message on Good Friday in humility and willingness to be led. As with all of our work, these writings have been initially cleared by our local authority and also by a theologian. They are consistent with our faith. When these writings are put into a book, we will apply for a formal Imprimatur, as we always do. But you can be confident that everything we offer is consistent with our teachings and supports both personal holiness and unity in our Catholic Church. Lay Apostles, let us dispose ourselves toward God with gratitude and a spirit of service to our Church, because it belongs to Jesus, who loves us all so much. Below are the six Passion Locutions. “My Passion was offered to the Father as an example of human love perfected. Can a person live in the world, with all that it offers, and maintain a perfect position of love toward the Creator? Yes. I proved that it could be done. I was divine, even in my humanity, but I subordinated my divinity so that mankind would see that if one will only put the Father first, love will surround him and he will live in joy. I lived in joy. Do you believe it? Can people understand that I put the Father first and still existed in perfect joy? It is true. I did. When one is in unity with the perfect love of one’s Creator, joy is not only possible, it is an unchosen state. When I say unchosen, I mean that it is so spontaneous that one finds oneself in joy unexpectedly. One chooses the Father, and one then experiences joy. One is tempted to sin, and one chooses instead the Father’s way, and one then experiences joy. There seems to be a time elapsing between the temptation, the choice for righteousness, and then the joy. Children of the Father, there is no time elapsing. Time ceases to be for those who remain fixed in love and fidelity toward the Father. These temptations that come float by. To be tempted is not to be sinful and there is no method of sin attaching to an apostle who has decided completely for the Father. One can be immersed in temptation, but if one simply continues to choose the righteous path, that person remains safe in the Father’s love. Truly, if thoughts are directed to God then people will experience life as a journey through a beautiful world. Mankind is with God in the world insofar as he chooses God’s ways and God’s thoughts. 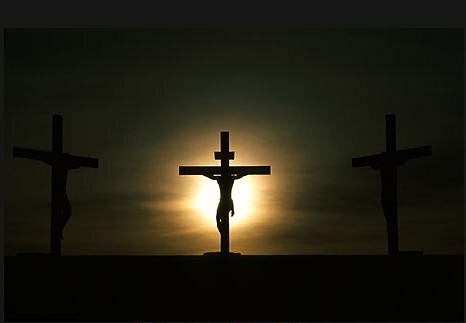 My wounds, suffered for the sins of mankind, should be viewed as demonstrations of My love, which always reflects the Father’s love. When a person says that he loves someone, it is a good thing. When a person says that he loves someone, then uses his very body to protect that someone, there is little doubt that his sentiments of love are both true and deeply held. I did that for you. My sentiments of love for each of God’s children are true and deeply held. I love you, dear child of the Father. I am connected to you intimately as one who has offered one’s own life for another. We have a bond, you might say, an intimate bond that will never cease to be. I look at you steadily, craving notice. When you look at my wounds, do you see how much I love you? That is what I want you to see. I want you to look at my crucified form and believe that you are worth total love, total dedication, total immolation. You are worth everything there is and everything there will be. Any sacrifice is acceptable when it comes to your eternal life. Many people will be saved through my sacrifice and I will be in intimate relationship with them for eternity. But I hope for something more. I hope that you will begin an intimate relationship with me now. Why does it benefit people to study my Passion? Why does the sacrifice of one person for the good of another inspire us and console us? My friends, when we see heroic human sacrifice, everything trivial is stripped away. We look and we understand. God created humanity for noble goals. The hopes of the Father are realised when, against all worldly thinking, one person sacrifices himself, his well-being or his wealth for the good of another person. In families this is most common because when people know each other intimately, they do love each other and view each other as valuable and important. In families where this unconditional and full commitment to the good of each other is absent, for any reason, the individuals may be without awareness of their foundational worth. For those people who feel unloved, we must work hard to persuade them that they are crucial members of the family of God. That is our work if we serve the Father. Why was I convinced that my very life should be given over to the plans of the Father? My friends, I was in the world but I was aware of the next life for everyone I met. 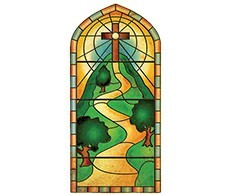 My cross directs the eye to the next world. My lifeless form does not prompt despair, because I overcame My death through the Resurrection. Do you see? Death is not the last thing. It is only the last thing on earth, in the human experience. I want my cross and my lifeless form on the cross to prompt people to think of their next life, their heavenly home and all of the hope that comes with those thoughts. When someone looks at the cross and me on it, lifeless, they should remember that sacrifice is temporary. Eternal life is permanent. The lesson offered from the cross is one of hope in the unconditional love of the Father, in sending Me, yes, but also allowing Me to give in totality for the wellbeing of each person ever created by the Father. My cross should prompt one to study deep and complete conviction, along with complete trust and hope in the Father’s presence and the Father’s plan. Do not think when you are maligned or misunderstood that the Father also misunderstands you. The Father loves you, in every situation. You are understood. You will be safe in Heaven and every sacrifice and suffering will be rewarded and celebrated. Be deeply peaceful when you study my Passion. It is a sign of both love and determination. For those who follow My way, I offer ongoing prompts and direction. The experience of following My way will be different than if you do not follow My way. In following Me, you will have My direction, yes, but you may not be certain about how to achieve what I am directing you to do. Be at peace in this uncertainty. You will have all that you need to bring about My will for you and My plans for you. Do you see that there exists in this the opportunity to live in peace, even in uncertainty? When you trust in Me and My goodness, you recognise that you live in perfect safety, regardless of what is happening around you. Who will stop Me? I offered My life for you and then, after the sacrifice was complete, I returned to life from the dead. Do you understand? There will be no enemy against you who is stronger than God and I am God. When you look at My still form on the cross, see Me as God, who stops at nothing, not even death, to establish your safety in the kingdom. If I am willing to die for you, am I not willing to remain with you in every moment? Contemplate this. Your Saviour has given His life so that you may be protected from the death that is caused by sin. If I am willing to forgive my murderers, and even beg the Father to forgive them, how serious will I be about protecting those who love me and serve Me? You are everything to Me. I feel such deep personal love for you that I will remain on duty and alert during every moment of your life. I did not save you so that you could be lost, but continually found by Me. I do not change My sentiments for you. In each moment you feel discouraged or anguished, I remain with you, prepared to comfort and console you and also help you to recover from all distress. When you look at my cross and Me lifeless on it, I want you to remind yourself, again and again, that I am God with you, ever present in your moments. You have only to turn the eyes of your soul to my eyes. I am there. I am always there. My eyes are full of love for you. Please remember My love. My love overcomes any guilt that you may feel. I did not die for you because you would be perfect on earth, but because you would make mistakes and take actions harmful to yourself or other people. I knew this and I loved you perfectly in this reality. I did not want you to be overcome by your mistakes. I knew you would need to recover, again and again, in My love. I knew you would need to be freed from your guilt and so I absorbed every bit of it in my body on the day they crucified Me. Please understand that this was my great joy. I wanted to do this for you because of your beautiful goodness. Right now, I see all of your goodness even though you may not be feeling confident about your goodness. We are a team, you and I together. I will bring out more and more goodness from you by noticing it for both of us. Any goodness in you delights Me and in prayer, I show your goodness to you so that you, too, can be delighted. In prayer, we are together in a profound way. By studying My Passion and My determination to sacrifice fully for each of God’s children, you will find your determination to sacrifice for Me, and for our Father’s goals. “When we gaze into a still lake, we can see our own reflection. I am that way, too. When you gaze at My figure on the cross, you see Me, and My love for you, but you also come to see yourself reflected back. Spending time with Me acts as a mirror and you begin to understand yourself better. Why is this important? Because when you understand my physical brokenness on the cross and feel compassion for Me, you come to understand your own brokenness and feel compassion for yourself. I want this for you. I want you to be loving toward yourself and understanding and compassionate. When you accept that I submitted to a plan that was bigger than one day, you can learn that your difficult days, also contribute to a greater plan than you can see in one moment. You can learn to trust in God’s outcomes, even when your life seems full of pain and suffering and uncertainty. God’s outcomes are so full of love and truth that any suffering is quickly obscured. When you can see the value in suffering, it becomes easy to bear, such as physical labour for a physical goal. ‘It is worth it’ one thinks to one’s self. When you can see no value to suffering, such as in the case when innocence is offended and injured, there is a great need to trust in the certainty that the Father will bring both healing and justice. This need is the difference between peace and often grave disturbance and even torment. The Father wills recovery for all. Recovery is available and it is a certainty in the heavenly kingdom. But often, through prayer, recovery comes on earth and any suffering you endure contributes to enormous development. I want this for you. I want you to benefit from any cross you have carried. I want you to know that I am with you in any cross you carry today. I will lead you to the answers just as the Father led me through My life. I have the answers for you. I want to offer a promise to everyone who desires a relationship with Me. My promise is this: I will thin your perception of distance between us. If you want to have a relationship with Me that is intimate and constant, I will help you to remain disposed toward Me. This is the time to rely on Me. If you are struggling, then this is your answer. Come into a closer relationship with Me, which I will support, and you will come to know Me in a way that changes your perspective of your struggles and fills you with hope. I want this for you. Do you want this for you? Do you want this for Me? Talk to Me in your heart about your worries and hopes and I will show you how to change your life if it needs to change. Remain close to Me and I will show you how to do all of this without even thinking. Rather, I will show you My way of being. When you accept from Me freely, and also give freely, I can give you more and more. A generous heart will draw from Heaven in a profound way, steadily and always with a surplus. What would I withhold from you? Nothing. I cannot resist you. We are meant to be together and you are meant to live a life which is constantly supported by Me. You need consolation at times. I suffered intense loneliness at times during My life. I chose the Father’s will always and this meant that My heart remained alert to Him first. You have Me to help you to live this way. I want to do this for you. I watch you trying and you are so full of goodness. I can help you to know you are loved and to live as though you are the Father’s only child, the heir to all. Please trust and believe that at every moment I am seeking contact with you. Turn your thoughts to Me and you will see that I am there, waiting, as alert to you as I was to My Father. How does My Passion speak to people of every age, in every time? People can be confused by the events of their time. People can become distracted by the events of their time. People, however, recognise love. Love is a universal language, a constant communication of God. Who, around you, loves? That person represents Me in that when you see love you will know that I am near. Who speaks of love? Who offers actions that communicate love? Who stands for love and remains aloof to distraction and despair? Love, sometimes only love, changes hearts, prompts repentance and frees a person from defensiveness enough to acknowledge his or her guilt in relation to the failure to love. Do you see what I am telling you? We will not bring people to the Father through anything but love. And so, my friends, are you studying love? Are you trying to become more perfect in love? Do you love yourself in the sense that you understand that your wounds are important to Me. Your suffering is visible to Me. Just as you gaze at My Passion and feel determination to remain faithful to Me, I gaze at your sufferings and I remain determined to comfort you. There are times when I spare you suffering, supernaturally, because it will not benefit you or others. If you are not spared suffering, and you are carrying a cross, remember that I allow it for your growth and for the salvation of those who need help. Your suffering, like Mine, is allowed by the Father in a temporary way so that we can offer sacrifice for others. These crosses we carry with determination are proof of our commitment to our Creator, who never pauses in pulsing love into the world. Our Father was able to send pulsations of love through Me. Is He able to send them through you? Do not ask yourself if the person you are thinking of is worthy of love. That person IS loved. And that is all you must know. The Father loves all of His children and so must we. Today, ask yourself if you are actively loving people. ‘Am I active in my obligation to love?’ That is your question. Every day I spent on earth, I loved actively. So must you. We must love as a decision, with such force that the world changes. Love does change people. You know this because you have already changed because of My love for you. Focus on offering My love to others and you will live a life truly following Me, Jesus Christ.